Our success is measured through the lives of the clients that we serve. Over the last 15 years, as both the number of clients served and volunteers involved in our work has increased, the need for capital improvements has become a mission-critical challenge. We’ve launched a Capital Improvements Campaign and are asking for your help to reach our fundraising goal. The projects we have planned will increase our capacity and ability to serve the increasing number of clients who turn to us in their time of need. This campaign will have a lasting impact on the dignity of our clients and efficiency of our operations. 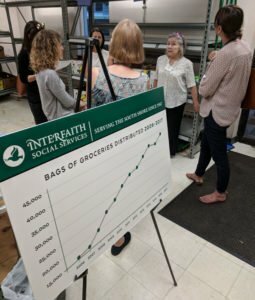 In the past decade, we have seen the number of food pantry clients in need of food assistance climb from 10,000 per year to more than 23,000. 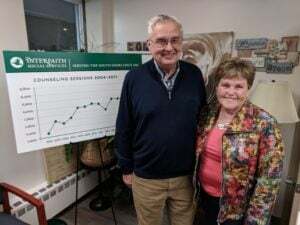 In the same time period, the New Directions Counseling Center has gone from providing 1,900 counseling sessions to more than 2,500 sessions per year. As programs have expanded, the need for facility improvements has become apparent. 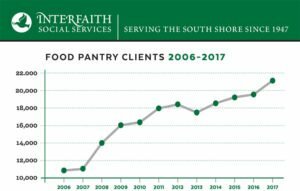 Our Pantry Shelf program is one of the largest food pantries in Greater Boston and the only one operating a robust food rescue program. We salvage more than 300,000 pounds of food annually from local grocery stores. This perfectly good food would otherwise enter the waste stream. 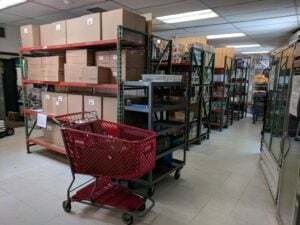 Instead, it provides more than half of the food distributed annually in our food pantry and enables us to offer a wider variety of fresh, frozen and baked goods to our clients. 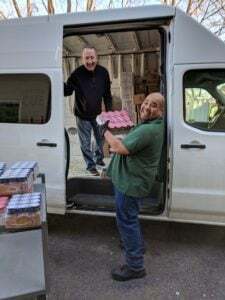 Due to truck weight limits and the lack of an internal freezer insert in our current van, we are often leaving food on the loading docks of our partner businesses that could otherwise have been distributed to food pantry clients. A freezer insert in the van will significantly increase our efficiency. We would be able to pick up food from multiple supermarkets without fear of frozen goods thawing out. WATCH VIDEO: Geoff, Interfaith’s Food Pantry Driver, talks about why we need a new food rescue van in the video above. Currently, five large freezer units are used in the food pantry, with an average age of 10 years old. Replacing these units with a walk-in freezer will double the storage capacity for frozen meats and other foods while creating more space for shelf products. Additionally, a walk-in freezer will reduce Interfaith’s energy costs. When we purchased this building at 105 Adams Street in 2003, our counseling center was providing 1,300 sessions per year to clients who had no place else to turn for help. Since then, the need for our services has increased more than 90%. 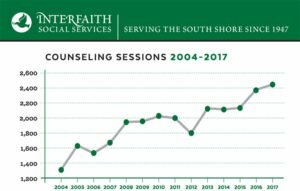 This year, our therapists will conduct more than 2,500 counseling sessions. 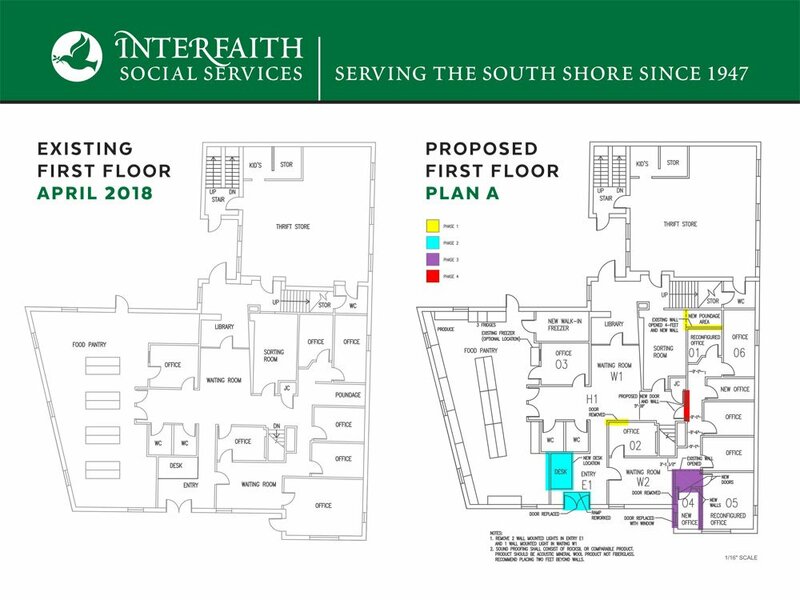 Our Capital Improvements Campaign will allow us to split two larger offices into four unique spaces and soundproof all counseling office spaces; thus allowing our therapists to meet the growing demand and giving them the space that they need to carry out their mission. A therapy session is a sacred time. Counseling offices need to be soundproof so that clients can feel open to express their emotions while being insulated from distractions outside the room. With our current floor plan, several offices are too close to the very hectic food pantry. Under the new plan, offices are moved and a door is installed to create more privacy. More than 40,000 South Shore residents walk through our doors every year. It is a high traffic area. As such, our facility requires a number of upkeep and repair projects including: replacing flooring on the main stairs, replacing light fixtures to increase energy efficiency, repainting the food pantry waiting room, reconstructing the ramp at the front door, replacing sagging shelving in the food pantry, installing a new front door for the building to resolve locking issues and improve accessibility, parking lot resurfacing, pothole repair and line painting. This project will also allow us to overhaul the layout of our food pantry. Our current layout creates numerous traffic jams as 10-15 volunteers assemble bags of groceries for our clients. Our architect has come up with a much more efficient layout. It helps that she is a current food pantry volunteer, so she understands firsthand the ins and outs of the program. We anticipate completing these projects in stages, as funding becomes available. We hope to initiate the first project Fall 2018 with a goal of completion of all three projects by summer of 2019. We hope to raise $175,000 by the end of the year to fund the changes.